12 February 2007: The 1960s-built Boston City Hall is perhaps one of the most controversially discussed municipal buildings in the world. This monumental structure, consisting of nine floors and located at the heart of the city, has been both praised and condemned. City Hall, which contains the Lord Mayor’s office and the municipal government of Massachusetts’ biggest city, was designed by popular architects of the time Noel M. McKinnell, Edward F. Knowles and Gerhard M. Kallmann, all Columbia University professors. In the 1962 competition to design the building, theirs was chosen out of 256 entries. Their plans revolved around the theme of creating a public and accessible character for the headquarters of the city’s government. 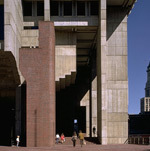 The three worked together, in co-operation with a number of Boston architectural firms, forming the Architects and Engineers for the Boston City Hall Society, which was put in charge of building the new City Hall from 1963 to 1968. The edifice was inspired by the concept of civic monumentality, and a variety of styles were adopted. Parts of the building seem to show the imprint of architects such as Le Corbusier. This is shown, for example, by the exposed concrete structures of the building. Then again, some elements echo instances of classical design, such as the coffers and the architrave above the concrete columns. The City Hall is divided into three sections, incorporating both utility and aesthetics. The lowest portion of the structure, the brick-faced base (brick is typical of Boston buildings), is partially built into the hillside and consists of the four levels of the departments of city government to which the public has wide access. The middle of the complex houses the offices of public officials, including the Mayor of the City of Boston, Thomas M. Menino, who is currently serving his fourth term. Besides the Mayor’s office, the City Council and the Council Chamber are also based in that part of the complex. The large interior and exterior spaces symbolise the ideal of a public connectedness with these areas of city government. These dramatic outcroppings contrast sharply with the character of the other two parts of the structure, which were intended to create the effect of a small city of concrete-sheltered structures. The upper storeys contain the city government’s administrative offices and various agencies and departments, such as planning, which are not generally visited by the public. This utilitarian aspect is reflected in the standardized window patterns, which are in the style of the typical modern office building. Today, opinions are strongly divided among locals, visitors and those who work in the building. Some praise it as a landmark that contributes to creating and controlling urban space by the use of monumentality and humanity in the best traditions of great city building. Others, including many employees, see the building as a dark and unfriendly structure and describe it as a design failure in urban planning. In 2004, the eight-acre City Hall Plaza, which surrounds City Hall and is regularly used for parades and festivals, was chosen from hundreds of contenders as being the world’s worst single public place. But this dislike might be the result of a general ignorance of so-called ‘brutalism architecture’ found in most modern cities.